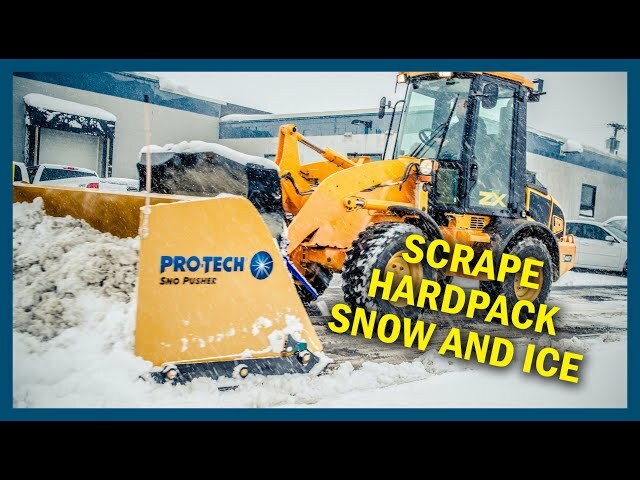 Scrape hard pack snow without "breaking the bank"
The Steel Edge Sno Pusher effectively attacks all types of surfaces, especially those that are uneven or covered in hard packed snow. 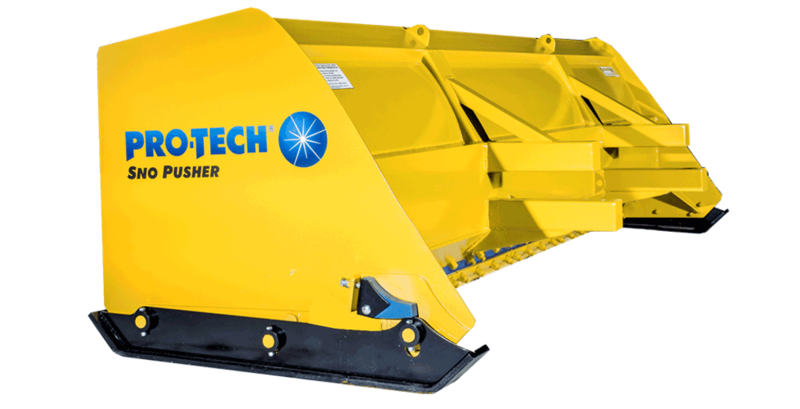 This snow pusher’s ability to scrape hard pack snow and ice can even reduce salt usage for some customers. 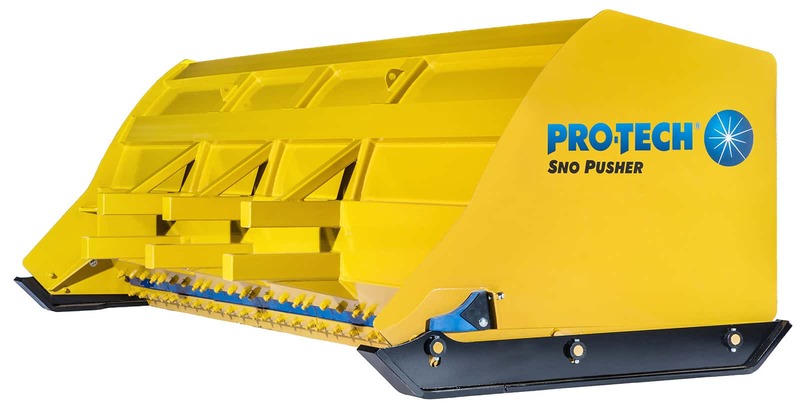 Also, unlike a sectional snow pusher or other steel edge containment plows that have complicated trip edges, the Steel Edge Sno Pusher has minimal moving parts and uses a corrosion resistant polyurethane hinge instead of springs, bosses, levers. 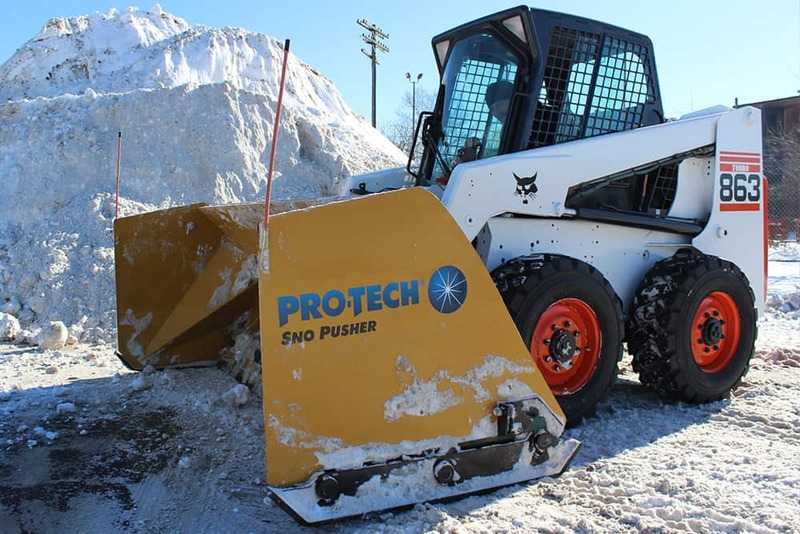 The snow pusher has no stacking or speed limitations. 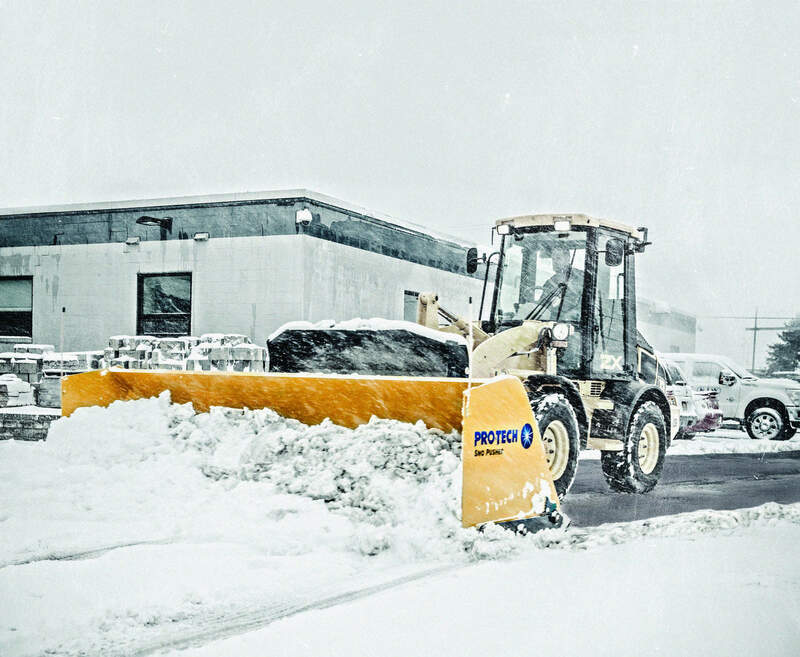 Customers can push that pedal, drive into that pile of snow, and get the job done better and faster. 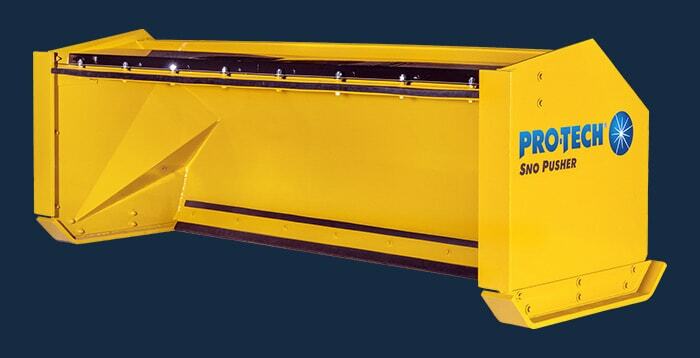 The Steel Edge Sno Pusher does come in sizes ranging from 6’ to 18’ for your loader, backhoe, and skid steer. 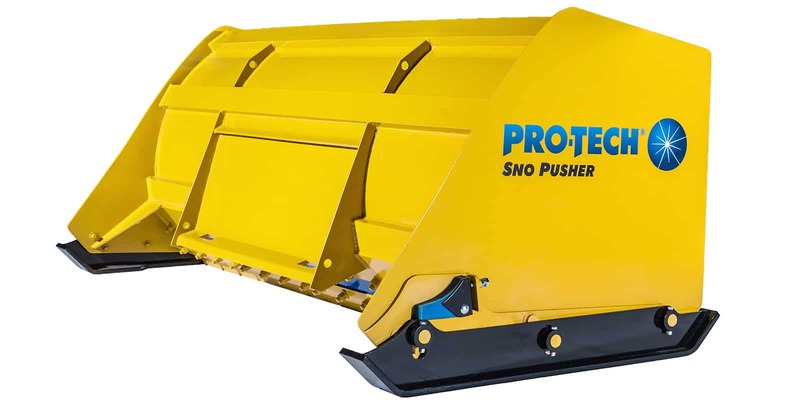 Steel edged sectional snow pushers are becoming increasingly popular in certain markets across North America. 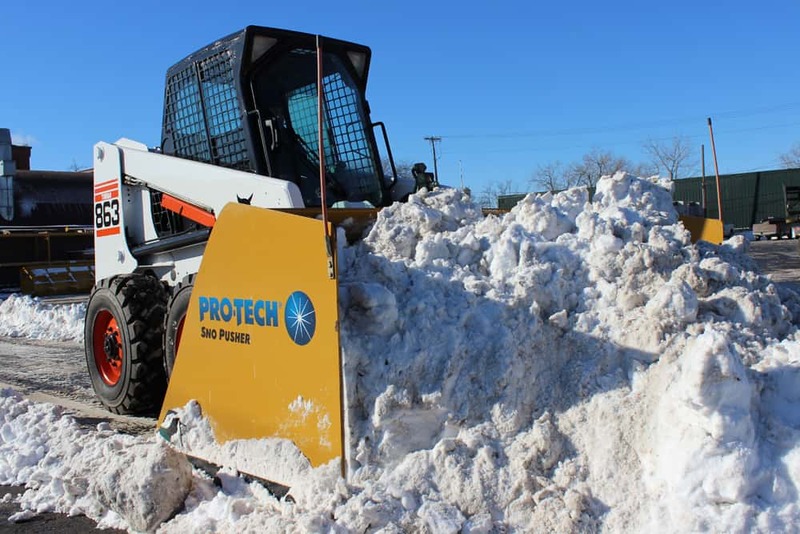 As salt prices and environmental regulations go up, the need to clear snow “down to black” on commercial properties is on the rise. 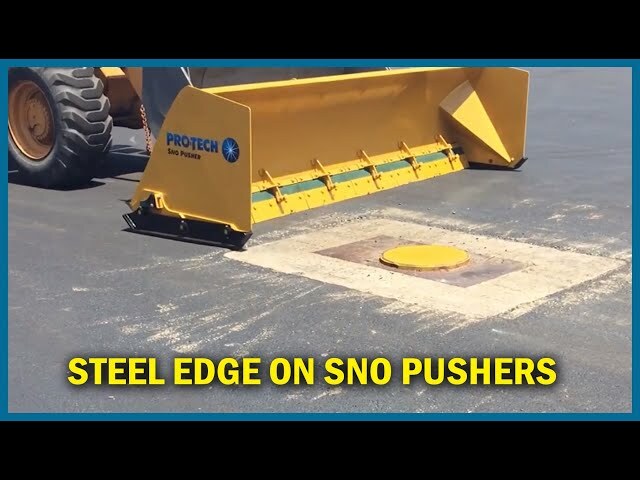 The Steel Edge Sno Pusher can help you to significantly reduce salt usage by contouring to the plowing surface and scraping up snow from heavily trafficked areas. 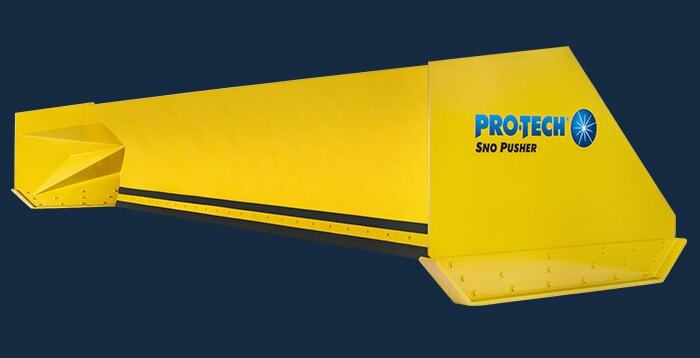 People often ask what is the blue material on our Steel Edge Sno Pushers. 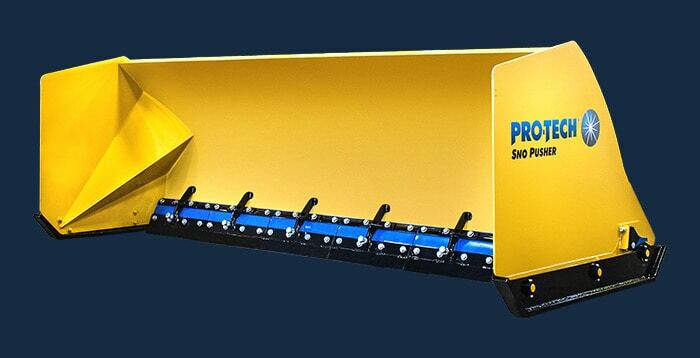 Many snow pushers on the market use complicated steel trip springs for their snow plows. 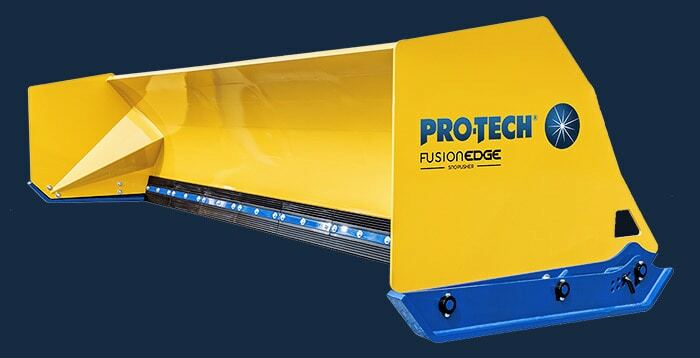 These edges typically work well UNTIL they break, resulting in heavy, expensive maintenance. 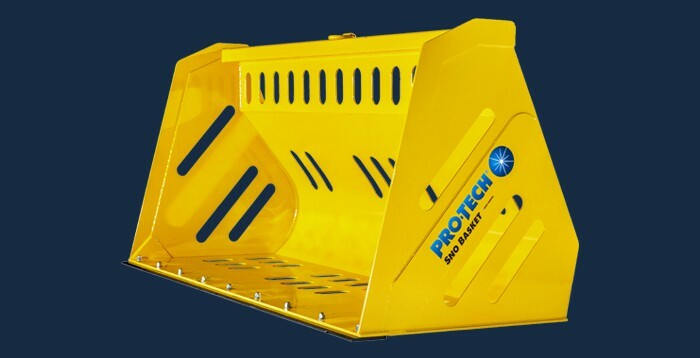 At Pro-Tech we try and make your work as easy as possible. 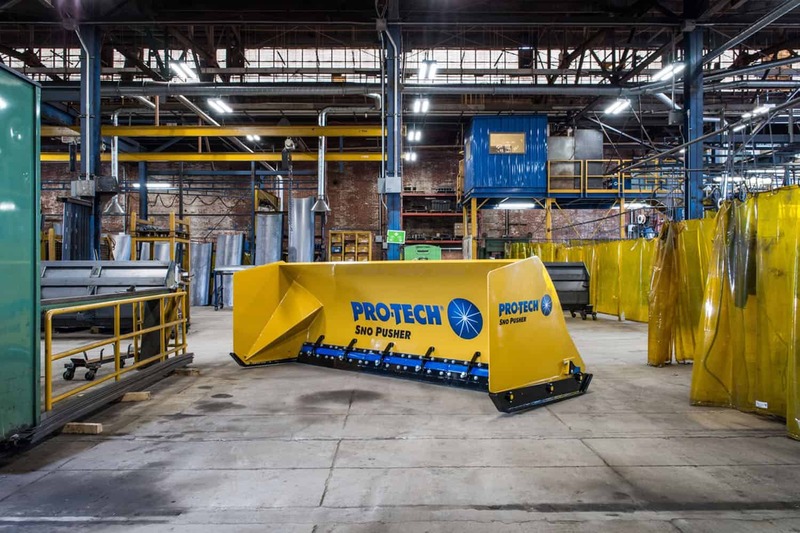 The blue material we use is a heavy duty polyurethane that acts as the trip mechanism for the snow pusher. 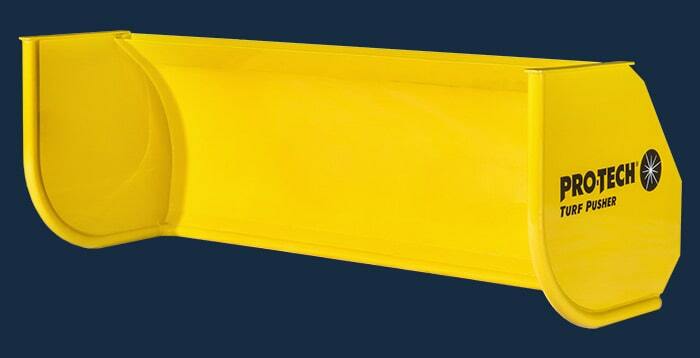 This UV and chemical resistant spring allows the plow edge to trip over obstacles such as manhole covers. 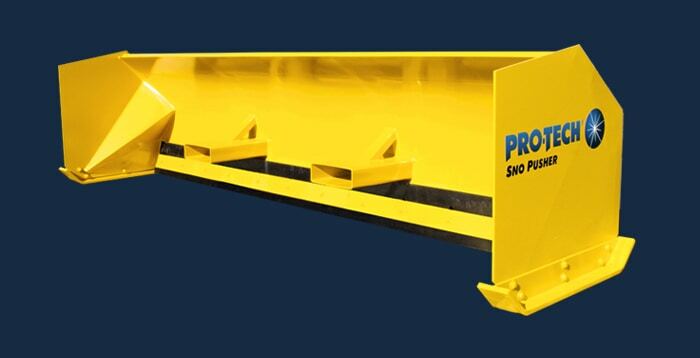 The 24” sections are easy to replace. 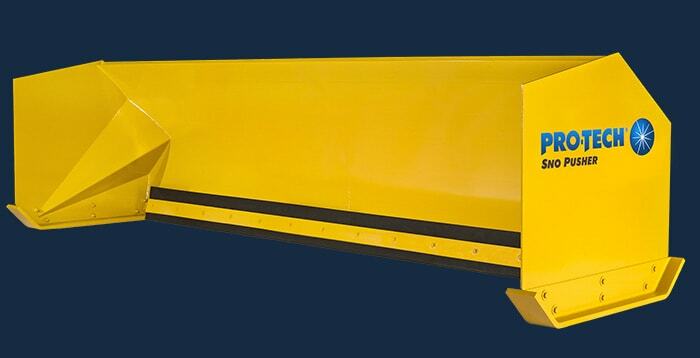 This sectional snow pusher also utilizes the blue polyurethane as a suspension. 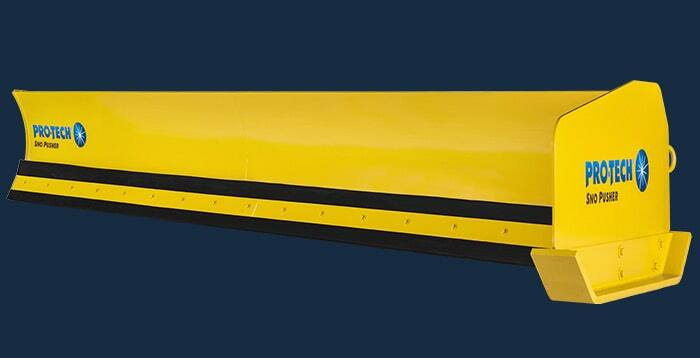 The blue poly works in tandem with the plow’s pivoting wear shoes. 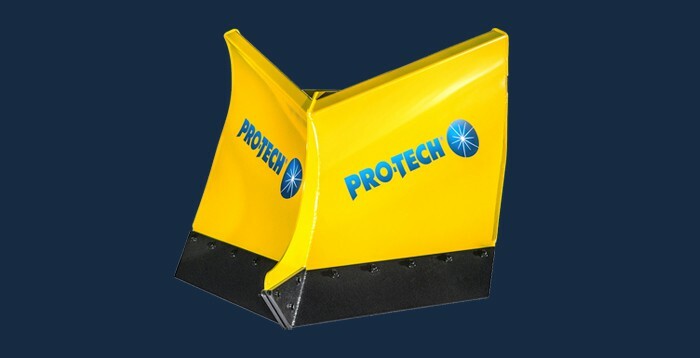 This shoe suspension allows the natural weight of the snowplow to apply down pressure and scrape hardpack. 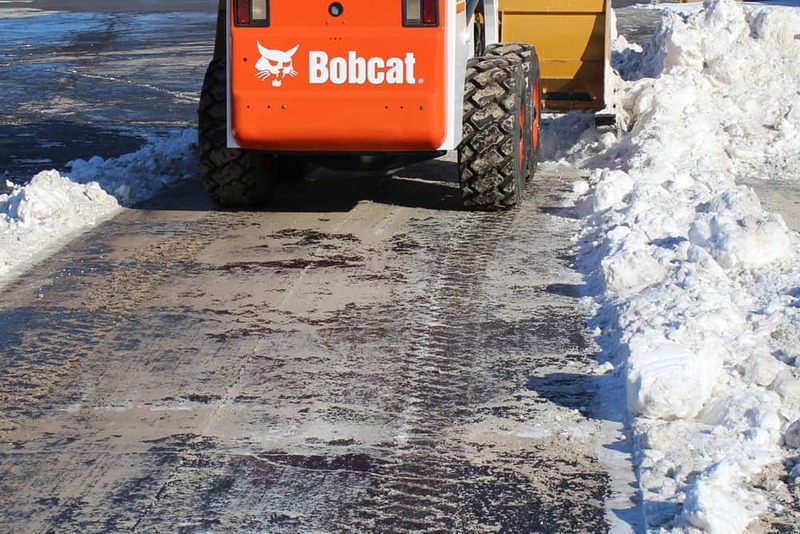 Operators can also use their loader, backhoe, or skid steer to apply extra down pressure when hard pack snow and ice is especially stubborn. 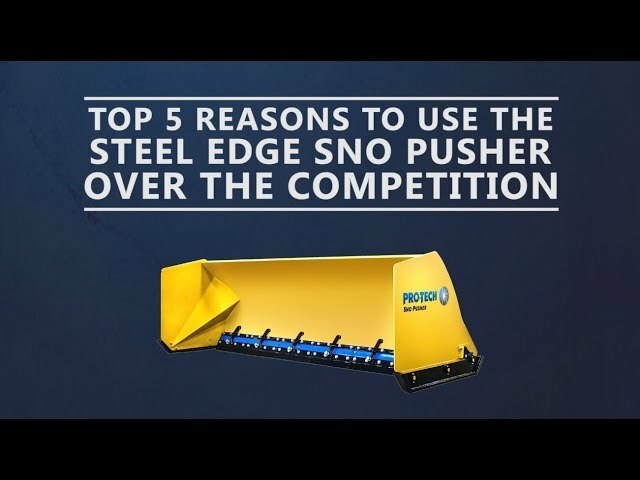 Competitive steel edge sectional snow pushers consist of complicated parts. 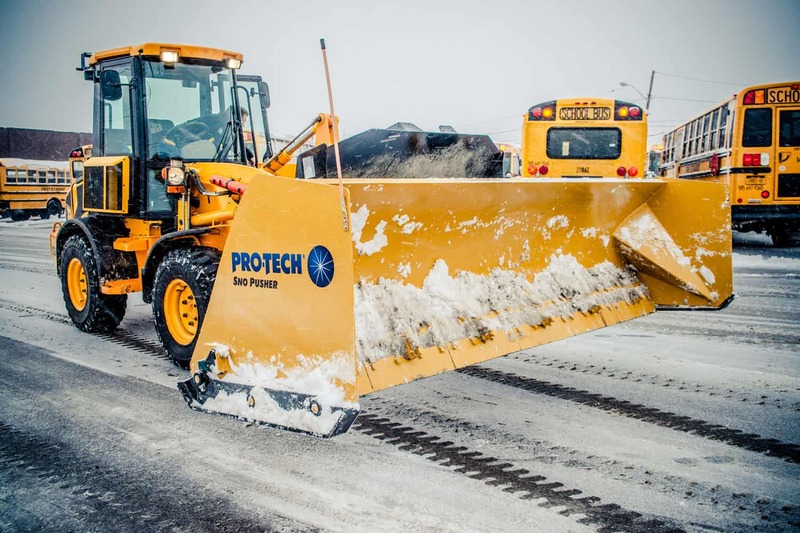 Most of these competitive plows have more “bells and whistles” than the customer requires to get the job done. 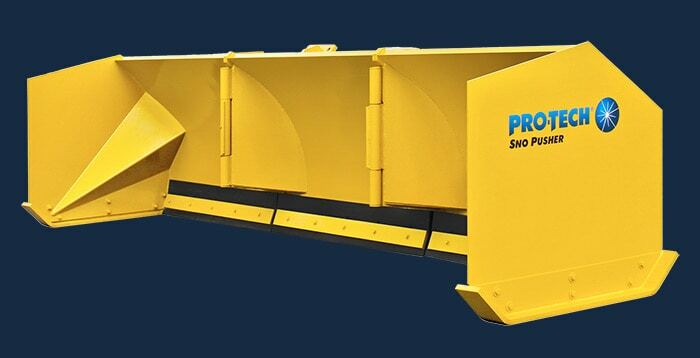 The Steel Edge Sno Pusher is a containment snow plow that offers simplicity and performance, all at a reasonable price. 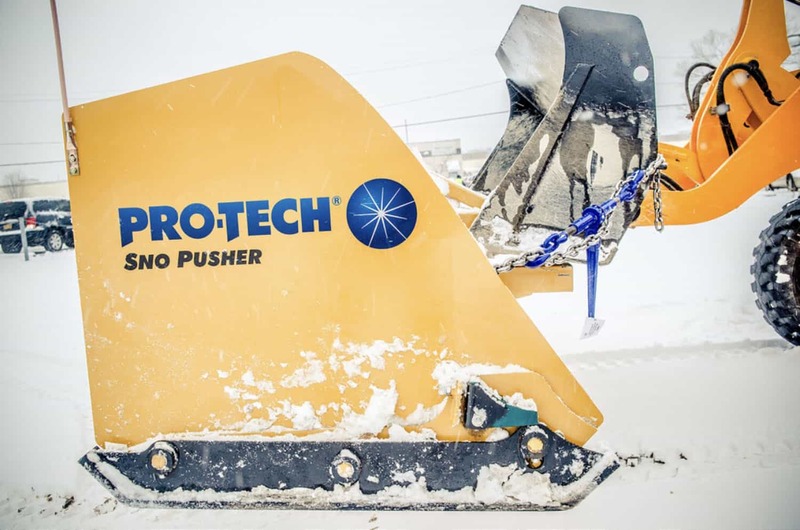 "The Steel Edge Sno Pushers work amazing and leave behind minimal hardpack. 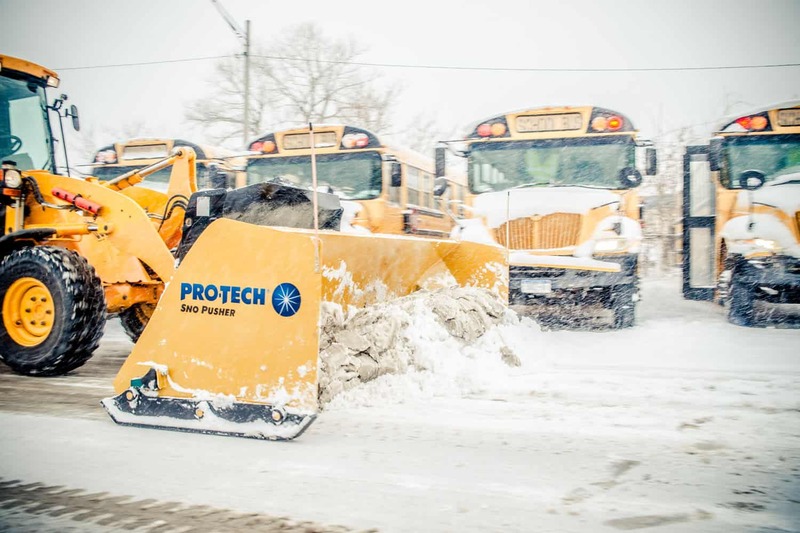 It lets me apply less material on a treatment and keep my locations in much better shape throughout the storm." 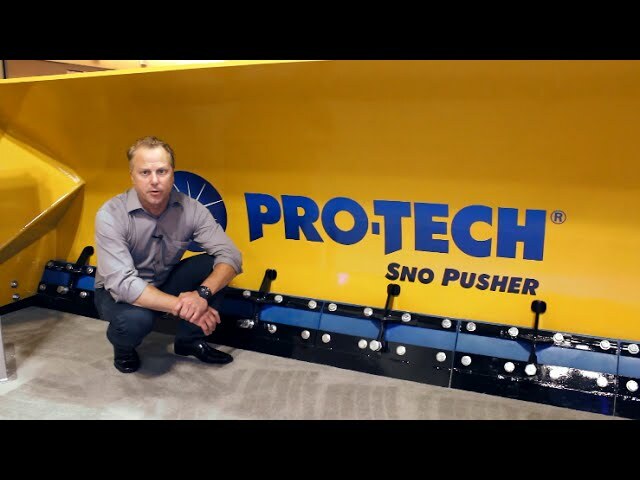 "I have a 10’ Steel Edge Sno Pusher and an 8' Rubber Edge Sno Pusher and love them." 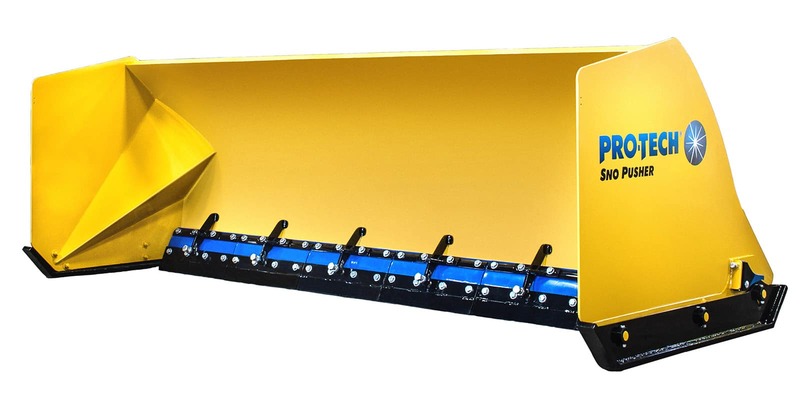 "Our new 14’ Steel Edge Sno Pusher worked flawless last night along with our 18’, 12’, and 16’ Rubber Edge Sno Pushers." 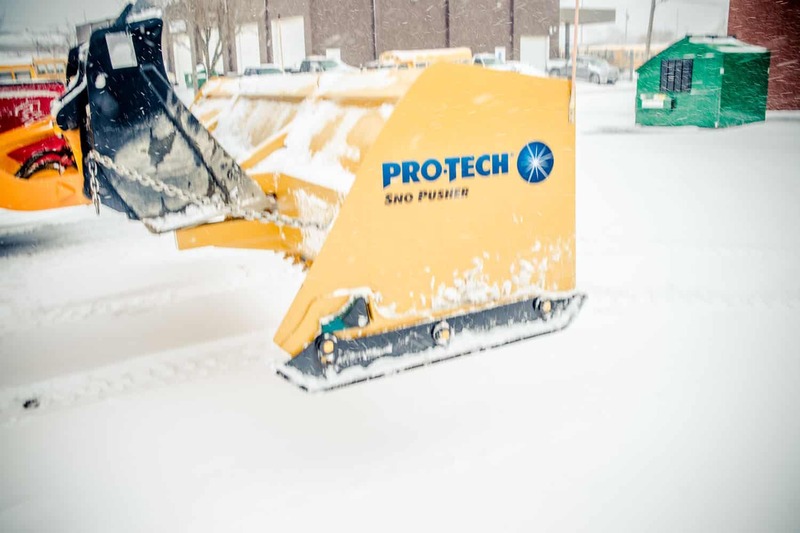 "One of our many Pro-Tech Sno Pushers. Best pushers out there!" 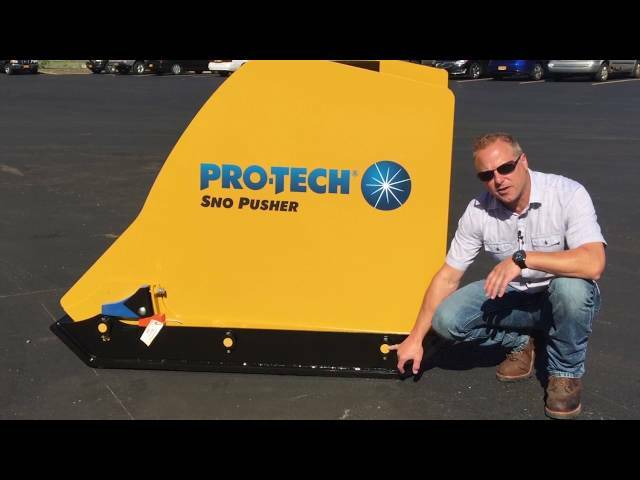 "The Steel Edge Sno Pusher was able to clean parking lots with one pass when heavy snow was packed on the asphalt." 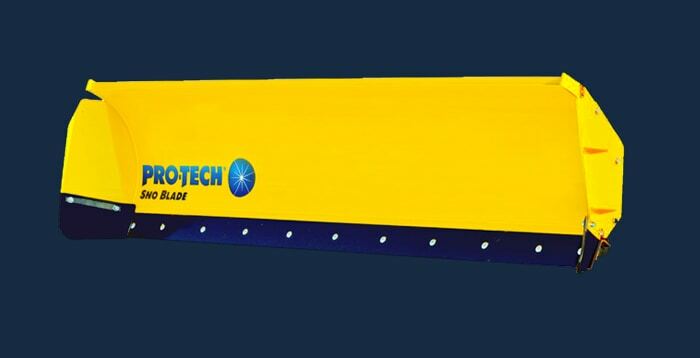 "We now run 5 Pro-Techs on our larger sites. 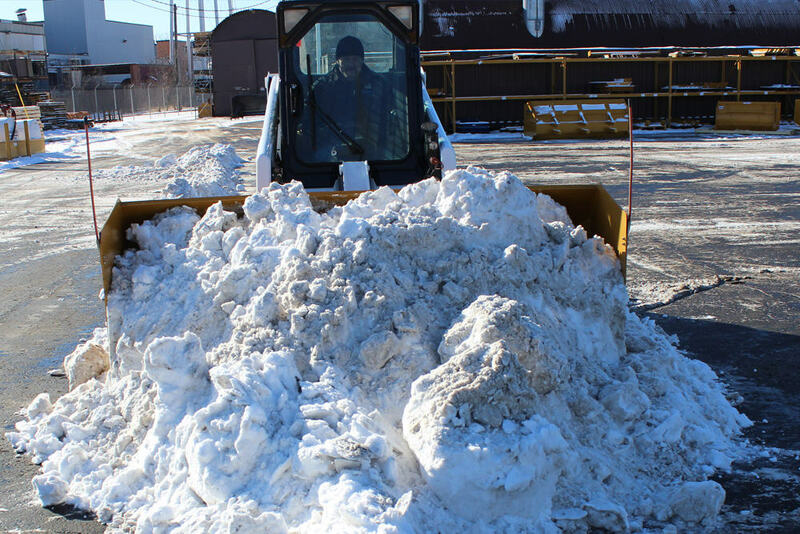 Without the use of containment plows, we simply would not have the snow removal capacity to retain these customers beyond the first snowfall. Night after night, they stand up and continue to function."